Cassandra Gregory's talent as a hockey linesman was recognized when she was assigned to work the men's final at a prestigious annual midget triple-A tournament in Calgary on Jan. 1. The 23-year-old from Edmonton also was nominated by her region's referees committee to work lines in the Alberta Junior Hockey League this season. Cassandra Gregory's talent as a hockey linesman was recognized when she was assigned to work the men's final at a prestigious annual midget triple-A tournament in Calgary on Jan. 1. 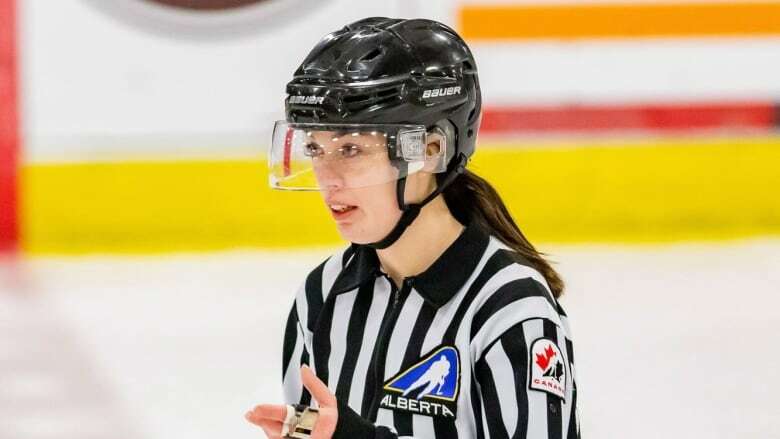 The 23-year-old from Edmonton also was nominated by her region's referees committee to work lines in the Alberta Junior Hockey League this season. She was asked in August if she was available for exhibition games, which would have made her the first female official in the AJHL. "Everybody was ecstatic because we've finally broken the female barrier in the Alberta Junior Hockey League," said former NHL linesman Mike Cvik, who now volunteers as an officials supervisor in the province. "Saskatchewan has already done it, B.C. has done it, Manitoba has done it." But Gregory was informed she would not work those AJHL exhibition games. She said she was told by Hockey Alberta referee-in-chief Craig DeCoursey "this was all happening because I'm a female. And those were his exact words. They didn't even try and hide it. "I honestly lost sleep over it for the first week and a half," Gregory continued. "I would sleep maybe two hours a night and wake up absolutely upset. I do have aspirations to work at the highest level possible." DeCoursey denied gender was the reason he gave to Gregory for the rejection of her nomination. "She expressed that to me. I tried to explain I didn't believe that was the case," DeCoursey said. "I feel like she went away not believing what I had to say. "It has absolutely nothing to do with gender whatsoever." But a referees committee member who spoke on the condition he not be identified said "the resistance is coming because she's a female and the extra hoops are being presented because of that." The AJHL assigns referees to games, but Hockey Alberta is responsible for assigning linesmen, according to AJHL spokesperson Charla Flett. "We've had female coaches go through our league, we've had female players go through the league and I think right now we're at 11 of 16 team trainers and athletic females are female, so it's something we're not shying from at all," Flett said. "I understand where the question is coming from because we don't have female officials right now. It isn't something the league is opposed to." Neither DeCoursey nor Curtis Nichols, who is both the AJHL's supervisor of officials and Hockey Alberta's manager of officiating, would say why Gregory was rejected or who made that decision. DeCoursey, Nichols and George McCorry, the AJHL's vice-president of officiating, are the ultimate authorities on which officials get into the league. Hockey Alberta's six regions nominate officials for the AJHL and assign linesmen to games when they've been approved. Nichols says roughly half a dozen referees and 10 linesman whose names are put forward by the zones each year don't make the cut. "Every region nominates referees and linesmen. There are people that are pushing certain officials and there's others that say people aren't ready," Nichols said. "There's a multitude of reasons why they may be rejected. "We're always looking for the best officials. It doesn't matter at all, male or female." Gregory calls both male and female hockey games, but works primarily men's hockey as a linesman in midget triple-A, junior B and college leagues. She worked the Alberta Midget Hockey League playoffs in 2017-18 up to and including the semifinals. In junior A hockey across Canada, there are four female linesman in Saskatchewan this season, Kaylah Krieger works lines in Manitoba, linesman Cydnie Rice became the first female official in B.C. in 2014 and Meghan Mallette referees New Brunswick Junior Hockey League games. Hockey Canada's officials certification system includes six levels. The highest level women can currently achieve is Level 5, which became available to them in 2014. Gregory is a Level 3 working towards her next certification. There are currently Level 2 linesmen in the AJHL. Edmonton's George Hart, an AJHL referee, has worked junior B games with Gregory in the past. Hart started out in the AJHL as a linesman and says Gregory has checked the right boxes to get a tryout. "The path I took to get to the AJHL years ago, I worked the same hockey she did," Hart said. "I'm not in that chair, but do I think she can do the games? Yeah, I definitely think so. "The attributes of a good linesman would be awareness and judgement. Her awareness has always been pretty decent trying to pick good spots to go to after whistles and be preventative so the referee doesn't have to call many penalties. "Judgment-wise, she's always been in position a lot of the time. She can tell if one guy and another guy on opposite teams are maybe having a bad shift with each other. One didn't like how he got hit and his first chance, he might try and go back at him if he can after a whistle. "I know she communicates well with the players letting them know 'OK guys, we're done' and trying to talk them out of doing worse." Gregory is five foot eight and 155 pounds. "It's not how big and strong you are in breaking up a fight," Cvik said. "It's the technique you use when they're done fighting. "You're not going to go in there and stop them fighting. You go in when they've stopped fighting." Former NHL referee Paul Stewart said at his December induction into the U.S. Hockey Hall of Fame that he would like to help women officiate in the NHL. But Gregory is worried she could pay a political price and get passed over for future assignments because she is speaking out about her situation. "There is a good chance I will never work [in] the league when this comes out," she said. "It could totally ruin my career on the female side too. "But I'd rather stand up for it and have it change in the future."